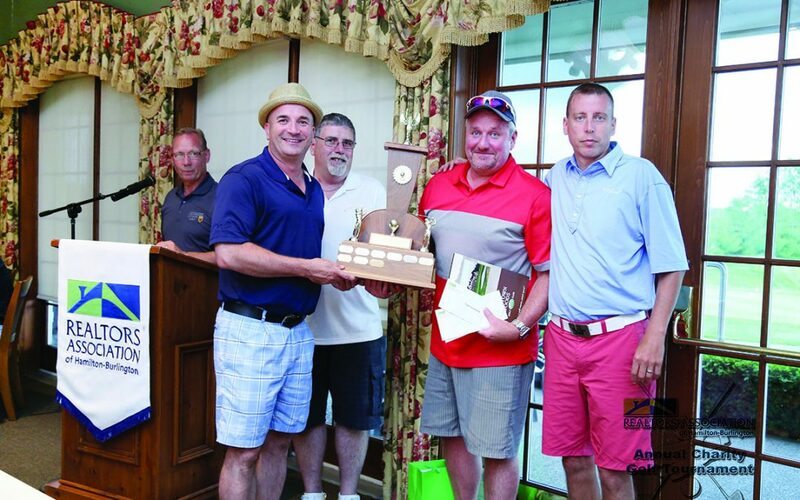 June 26, 2014 was a great day to golf at the REALTORS® Association of Hamilton-Burlington’s (RAHB) Annual Charity Golf Tournament at Copetown Woods Golf Club. Thanks to the dedicated efforts of the golf task force, REALTORS® and sponsors, over $12,067 was raised for the Home Ownership Affordability Program (HOAP) and the Karan Barker Memorial Scholarship Fund. HOAP is a unique affordable housing initiative in which the REALTORS® Association of Hamilton‐Burlington, the City of Hamilton and ScotiaBank partner to help families in social housing become homeowners. The benefits of HOAP go beyond helping just one family; HOAP also aids in neighbourhood revitalization and in freeing up existing social housing for other families in need. The Karan Barker Memorial Scholarship Fund provides scholarships to the children and grandchildren of RAHB members and RAHB staff. Students must demonstrate academic excellence and outstanding involvement in their school and community to be eligible for the award. “Getting out to enjoy a day of golf was great, and the best part was knowing we make a difference in the community and in the lives of our young people,” added Godsoe. The RAHB Charity Golf Tournament has raised over $224,000 in support of local charities since 1997.